Located at 52 Adrianou Street in Monastiraki, just a stone’s throw away from the historic city center with stunning views of the Acropolis, the new Hard Rock Cafe Athens is a must-see for both visitors and locals alike. The Cafe-Bar area features a beautiful internal atrium area with a sliding roof top. Guests can enjoy fresh, high-quality food from our food menu which includes a selection of our starters and salads, as well as our delicious Legendary burgers, steaks, fajitas and many more. Hard Rock Cafe's food items, are complimented by an extensive, award-winning drinks menu that includes delicious cocktails such as Hurricanes, Margaritas, signature favorites and Alternative Rock (alcohol-free) beverages, all available in Hard Rock souvenir glassware. Hard Rock's cocktails are handcrafted, just like its cuisine and as authentic as the memorabilia on the walls. Memorabilia from Hard Rock iconic collection adorns the walls of Hard Rock Cafe Athens, including items form legendary and contemporary musicians from around the world. Fans will be able to see Lady Gaga's silver and black boots worn during a 2014 photo shoot; a black studded bass owned by American rocker, Gene Simmons; an acoustic guitar owned and signed by Chris Martin from Coldplay; and much more. The Rock Shop offers rock 'n' roll inspired items, as well as collectible Hard Rock Cafe merchandise in its exclusive retail location. Hard Rock's Athens-specific merchandise can only be purchased at this location, which offers an exclusive design quality that enhances each item's appeal. Fashion meets Rock 'n' Roll by the sea side! Placed in the Cruise Terminal C’ (called ‘’Themistocles’’) of the Port of Piraeus we are excited to announce the official Opening of the Pop-Up Rock Shop for the cruise market on, on Thursday, May 18th. The Rock Shop will become a top preference on the shopping list for the cruise passengers of the biggest Cruise lines, such as Royal Caribbean, Costa & MSC. The Rock Shop has been designed to support the needs of the cruise market by the port and will become the ‘’talk of the port’’ both for locals and tourists. Please keep in mind that the Rock Shop is open when the Cruise Terminal is open for specific cruise ships. Whether our guests are looking for a gift for a special person, or the perfect clothes for your style, don’t miss the chance to take home one of our most exclusive Hard Rock items. If you are with a group of more then 8 persons and wish to dine from our regular Core Menu and not take a group menu you are able to come along on the day and join our wait list. For groups of 8 or more contact RESERVATIONS for more group menu options. See below 'Specials & Promotions' for online group packages. 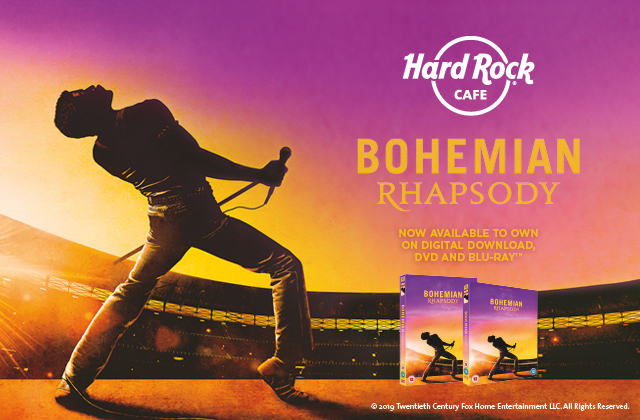 Freddie Mercury, is out now on DVD, Blu-Ray & Digital. And have a "rocking" time! Join us for a 'rockin' educational music program!